After the winds and rains of Hurricane Maria swept through Puerto Rico, the island was left in darkness. Electrical power generation was cut for 100 percent of households, cell phone towers went offline, and the airport and other ports closed operations, pending damage and safety reviews. In the days that followed, many municipalities, particularly in the interior, were entirely out of contact. How severely were they affected? Had the flood waters receded? Were structures still intact? Direct Relief regularly supports the network of non-profit Federally Qualified Health Centers (FQHCs) in Puerto Rico, which often serves the role of first responder for low-income and uninsured people in times of disaster. One of the first, somewhat experimental, steps was to expand Direct Relief’s analytics and mapping capacity by activating the Digital Humanitarian Network (DHN). The DHN is a confederation of professionals working in humanitarian aid, data analytics and information technology, which helps ensure a reasonably efficient process for building response capacity with digital volunteers. In this case, DHN was acting as the managing connection for humanitarian agencies to Planet, one of the world’s leading remote sensing companies. Planet operates a network of small satellites that capture images of Earth’s land area every single day. It was also one of the first sources of data for determining post-hurricane conditions in Puerto Rico. Remote sensing is the use of non-localized sensor technology, usually a camera, to collect data and analyze conditions at some point on the planet’s surface. If you’re unable to be physically present to observe an area, then it may still be possible to use orbital or other technologies to examine it from a great distance. 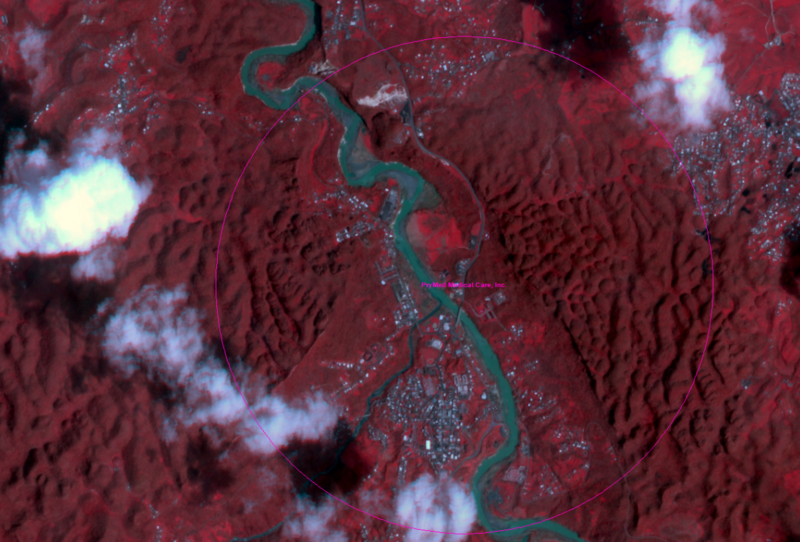 Planet has built a fluid online interface that allows users to filter and select imagery based on the type of sensors available, the amount of cloud cover in the imagery, the data and time it was taken, and the proportion of an area of interest covered by that single image. By dragging and dropping images into an online comparison tool, we could determine at least general conditions in that place relative to a pre-storm, undamaged baseline image. A screenshot of Planet’s Explorer platform where users can view daily satellite imagery of any place on Earth. The DHN played a crucial role in connecting Direct Relief to GIScorps, a group comprised of Geographic Information Systems (GIS) professionals who volunteer their time, especially during crisis response events, to improve the use of spatial information by humanitarian agencies. GIScorps connected us with a total of 7 remote sensing professionals within roughly 24-36 hours of Direct Relief’s initial request. The volunteers jumped in immediately by following a simple workflow to identify where the clinics were located and which imagery was available. Then they used a simple grading system to assign a probable damage level to the area – in some cases down to the building level. The process of remote sensing damage to Puerto Rico’s FQHC network faced some challenges right away. The first of these was cloud cover. This is a relatively obvious but important point for post-storm satellite-based remote sensing. Hurricanes are basically giant high-speed swirling clouds, often with long tails of precipitation. That means that looking through them to the ground level requires waiting for the clouds to clear, which in this case took several days. Compounding that problem of cloud cover is the issue of sensor resolution. The core advantage of Planet’s satellites is that they’re regularly taking pictures of vast areas. Those pictures are very timely and organized in such a way that it makes comparison across space and time relatively fast and easy to do. However, the imagery is best used for analysis of broad spatial trends given the size of the pixels, which are generally 3m – meaning that each pixel on screen represents a 3-meter x 3-meter area on the ground. That’s probably too coarse for most building damage assessments, but it works quite well for viewing the impact of flood waters or destruction of vegetation from the wind. Planet imagery will be significant in the weeks and months to come given its ability to monitor the situation on a daily basis. As the days went on, we also had to call upon additional sources of imagery from Digital Globe, which produces high-resolution satellite photos, and the Civil Air Patrol, which flew a series of small planes over Puerto Rico, taking pictures all the while of critical areas of interest. Each of those had an upside and a downside. On the one hand, Digital Globe Sensors were much higher resolution with smaller areas per pixel, allowing for something more like building damage assessments than area impact assessments. Sometimes, visual analysis isn’t enough. One of the key tools in the remote sensing toolkit is to utilize the full light spectrum to make different features of the landscape show up with greater or lesser intensity in the image. Various types of objects, from plants and water to structures, tend to reflect different parts of the light spectrum in different ways. This lets you see more than what the unaided eye can see. A false-color image like the one below, for a relatively low-damage area around one of the clinics in Puerto Rico, displays vegetation through reflected reds and darker water areas, revealing a better-defined view of key features compared to a typical photograph. The end product of the digital volunteers is the creation of an online map, which is being regularly updated with new imagery to show the locations and damage assessments of FQHC areas. Impacted areas are still being graded according to the level of damage to the surrounding area within a roughly 2km radius, in some cases less depending on image resolution. That’s too large to determine operational capacity but helpful to triage, especially areas which have not been reached in person, relative to their physical conditions. Damage assessment map for post-Maria Puerto Rico based on remote sensing and input from GIScorps volunteers. This map is the first effort by Direct Relief to work through the kinks of remote sensing for post-disaster public health planning, so it has seen its’ fair share of ups and downs. But the promise of using satellites to ensure that we can keep watch over the healthcare centers that treat the most vulnerable is undeniably one of the most promising yet still least well-utilized data sources available to humanitarians today. We’ll be sharing the results and looking towards new ways shortly to make sure that imagery is an active part of disaster response analytics.